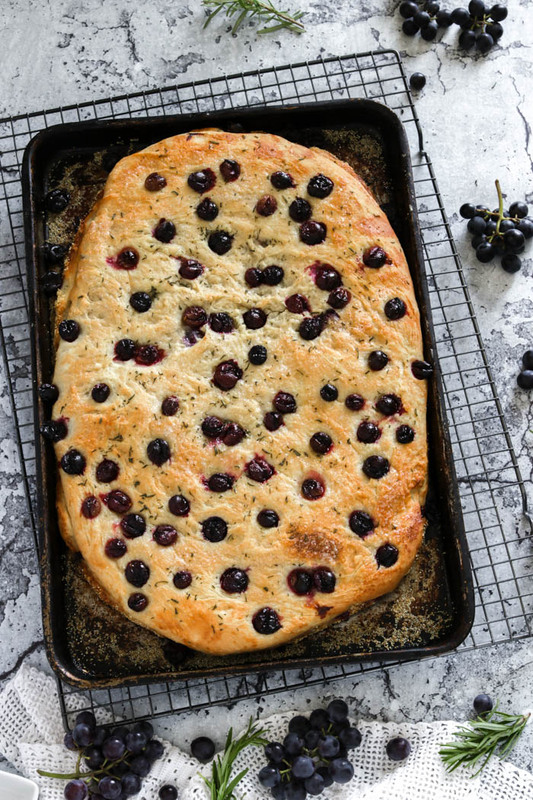 Schiacciata con l’uva is a sweet flatbread with grapes. More commonly known as focaccia, this flatbread is a seasonal dish made yearly during the grape harvest in Tuscany. This recipe was originally published in October of 2016 and republished September 14, 2018 with updated content and photos. There is much to embrace with the arrival of Fall. As the days get cooler and the air turns crisp, I get this sudden urge to roll up my sleeves and delve into the magical world of bread making. Or any sort of baking for that matter and wanting only to come up for air well after the Christmas holidays. Is it just me or do any of you feel the same way? This time of the year grocery stores and local farmer’s markets are laden with thin skinned, seedless coronation grapes. A rather regal name for these Ontario blue grapes is it not! They are vibrant blue in colour much like their relative the concord grape and quite interchangeable when making schiacciata con l’uva. Also, they have a deliciously sweet taste that simply bursts in the mouth, making them a perfect choice for baking or even preserving. 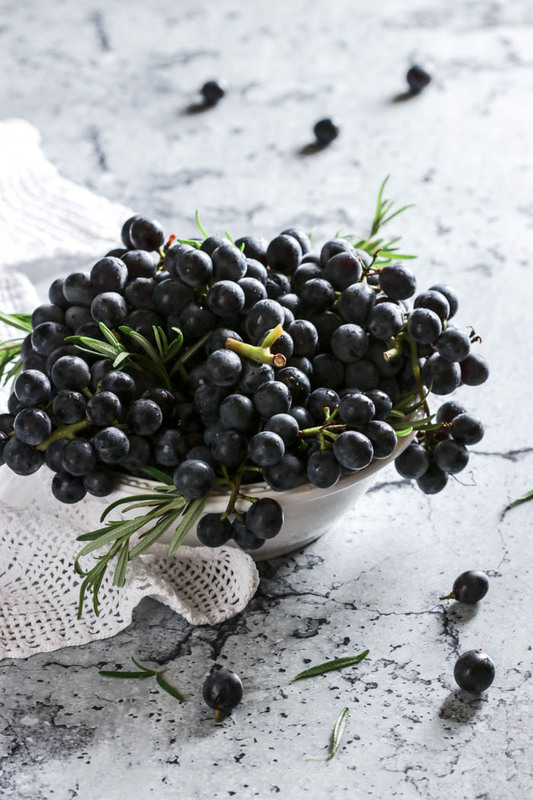 The sweetness of the coronation grape pairs beautifully with the savoury rosemary. Once baked you’ll find they mimic the taste of grape jam on toast. Definitely a lip smacking and finger licking delicacy! 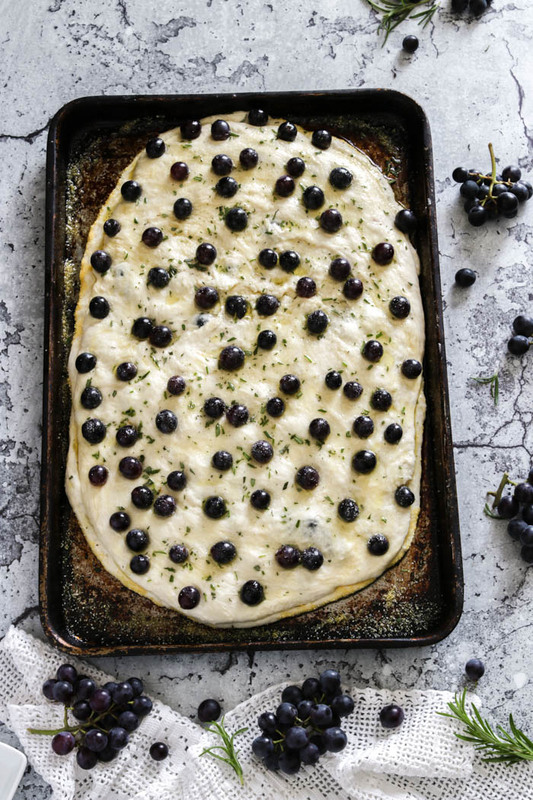 This Tuscan flatbread consists of two layers of dough which are sandwiched together with a filling of seedless blue grapes, a sprinkle of sugar, chopped rosemary and a drizzle of good quality extra virgin olive oil and topped with more of the same filling. It’s then baked to a golden brown perfection with yummy crispy edges that we all love. You can slice and enjoy as is while still warm with the grapes oozing their irresistible sweet juices. Or simply dust the tops with a sprinkle of icing sugar for some extra sweetness. Gather friends or family around your kitchen and bake some today! I’m sure it will become a new favourite seasonal recipe! 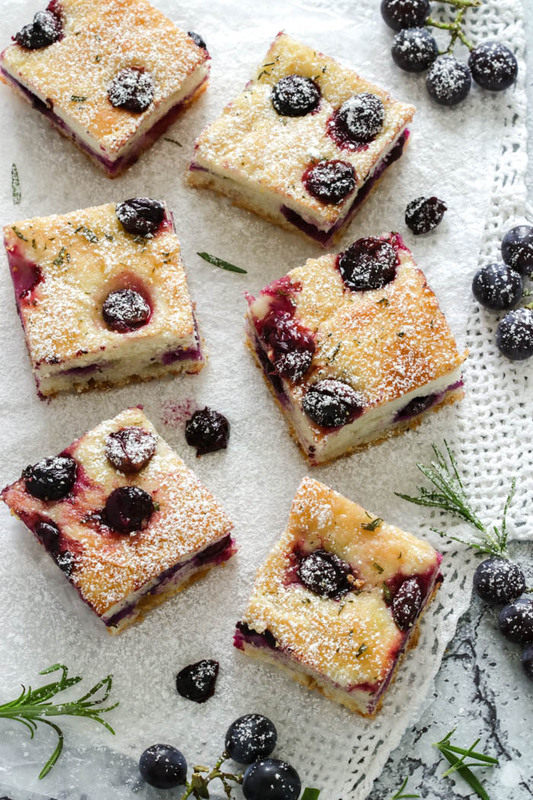 Schiacciata con l'uva is a sweet flatbread with grapes, a seasonal dish that is traditionally made during the grape harvest in Tuscany. Heat 2 cups of water with 4 tablespoons of olive oil in the microwave for 60 to 90 seconds or till lukewarm. Stir the warm liquids in the flour mixture with a wooden spoon, mixing well. Stir in another cup of flour till combined. Invert the dough onto a well floured counter and knead for a few minutes, working in the last cup of flour a bit at a time just until the dough is soft and smooth. (I only used up to 1/2 cup of the remaining flour). Grease a large bowl with some olive oil. Place your pizza dough in the greased bowl turning the dough to grease all over. Cover with saran wrap. Let it rise till it doubles in size for about 1 1/2 to 2 hours, in a draft free place. (on a sunny day I place my bowl in direct sunlight and this helps tremendously with the rising). When your dough has doubled in size, transfer it onto a floured work space. Grease a 17x11 rimmed baking sheet (or any large baking sheet you have) with some olive oil and then lightly sprinkle evenly with cornmeal. This will prevent the dough from sticking to the pan and impart a lovely crunch. Cut the dough in half and working with one piece at a time roll it out to the size of your pan. (its ok if it does not entirely reach the edges). Place the first layer of rolled out dough on your prepared pan. Layer 1 cup of the grapes, evenly spread, onto the dough while pressing them slightly into the dough. Sprinkle 1 tablespoon of sugar and 1 teaspoon of chopped rosemary, evenly onto the first layer of dough. Drizzle with some extra virgin olive oil. Roll out the second piece of dough and layer it onto prepared first layer. Press down slightly and pinch the edges together. Spread the remaining grapes over the top layer of dough, again pressing down into the dough. Sprinkle with an additional 1 tablespoon of sugar and 1 teaspoon of chopped rosemary. Drizzle more extra virgin olive oil evenly over the top layer. Bake the flatbread in a preheated oven, at 350 degrees F, for about 35 to 40 minutes or until the dough is a nice golden brown and the grapes are oozing with delicious goodness. 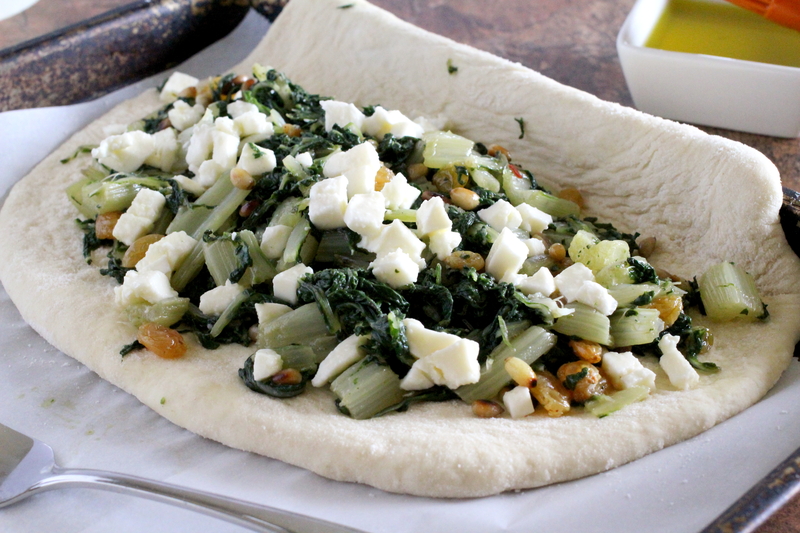 Swiss Chard Mozzarella Calzone are warm pockets of pizza dough stuffed with braised Swiss chard, fresh mozzarella, sweet golden raisins and toasted pine nuts for a delicious lunch or anytime snack. There is something deeply pleasing to me which comes in part from a continuity of sorts when making traditional meals. I find they bring to mind such fond memories of a time when those before us lovingly prepared the same food we so treasure to this very day. 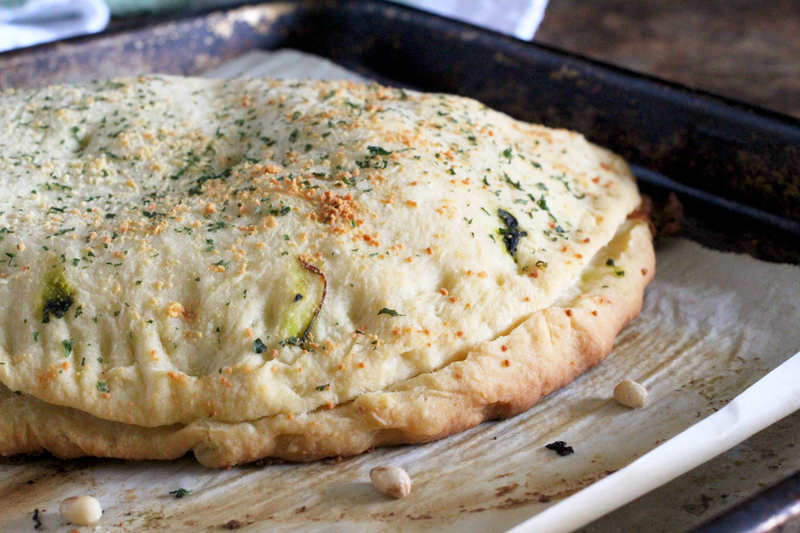 Usually served during the Easter celebrations, these Swiss Chard Mozzarella Calzone are so delicious you’ll want to make them all year round. 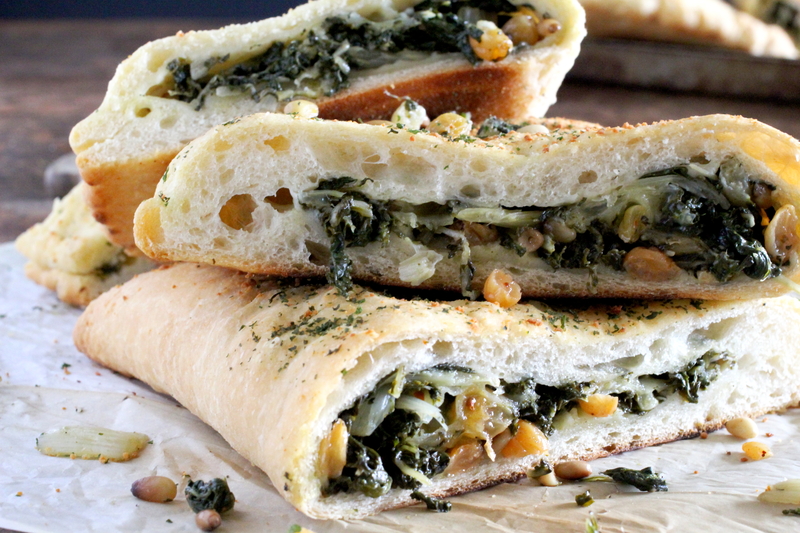 Although calzone can be stuffed with just about anything, these Swiss chard filled ones brimming with sweet raisins and tender pine nuts is a typical childhood dish. Sliced in small vertical pieces, they were always served as part of our antipasto before lunch or even dinner. I used a very basic focaccia dough recipe for my calzone, much like the dough used to make my Schiacciata Con L’uva. However, if your pressed for time store bought pizza dough will also work beautifully. Once assembled, all that’s needed is a light brushing of olive oil, a sprinkle of Parmesan cheese and some dried parsley flakes. A very hot oven works best therefore you’ll want to preheat your oven to a very high temperature of 425 or 450 degrees F to achieve a crispy outer crust. These Swiss Chard Mozzarella Calzone also make a rather relaxed meal accompanied with a crispy salad and complimented with a glass of wine. Enjoy them hot or cold and should you be so lucky to have any leftovers the next day try heating them up in a skillet or even a panini press. While the outer layers crisp up nicely the vegetable filled centers remain soft offering up a lovely contrast. 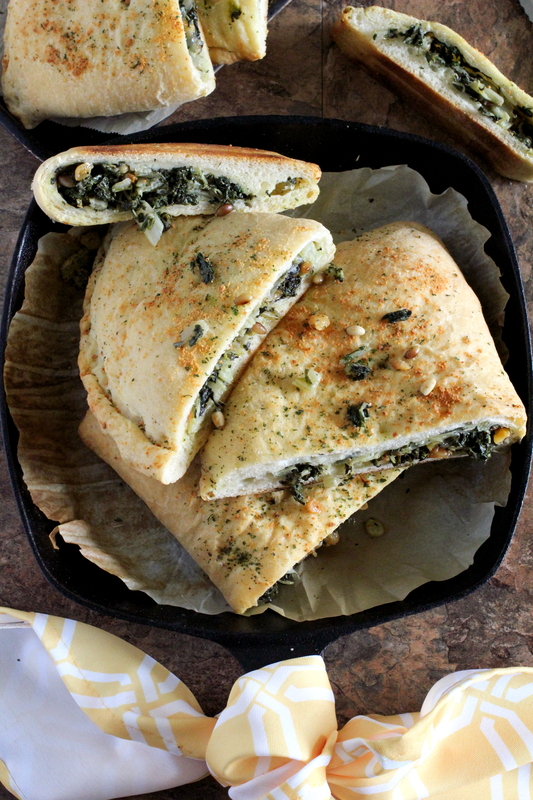 Swiss Chard Mozzarella Calzone are warm pockets of pizza dough stuffed with braised Swiss chard, fresh mozzarella, sweet golden raisins and pine nuts for a delicious lunch or anytime snack. In a large bowl combine 3 cups of flour, salt, yeast and stir well. Invert the dough onto a well floured counter and knead for a few minutes, working in the last cup of flour a bit at a time just until the dough is soft and smooth. Let it rise till it doubles in size for about 1 1/2 to 2 hours, in a draft free place. While the pizza dough rises prepare the Swiss chard filling. Heat about 4 inches of water in a very large stock pot. When water comes to a boil add in the Swiss chard and salt to taste. Lower the heat and cook the greens for about 10 minutes. In a large frying pan, add the oil with the smashed garlic, chili flakes and cook for about 1 minute or until the garlic is just slightly golden. Add in the drained swiss chard, pine nuts, raisins and salt and pepper to taste. Stir and cook the mixture for a few minutes, until the liquid evaporates. PREHEAT OVEN TO 425 degrees F"
Transfer the pizza dough to a floured surface and divide into 4 equal pieces. Roll each piece into an 8 inch round circle and place on the prepared baking sheet. Divide the Swiss chard mixture evenly between the 4 pizza rounds leaving a 1 inch border, topping one half while leaving the other half extended. Sprinkle the diced mozzarella over the filling onto each calzone. Fold the extended half over the filling while pressing to seal around the edges to secure the filling. Use a fork to press down along the outer edge or use your fingers to crimp the edges. Brush some olive oil over each calzone. 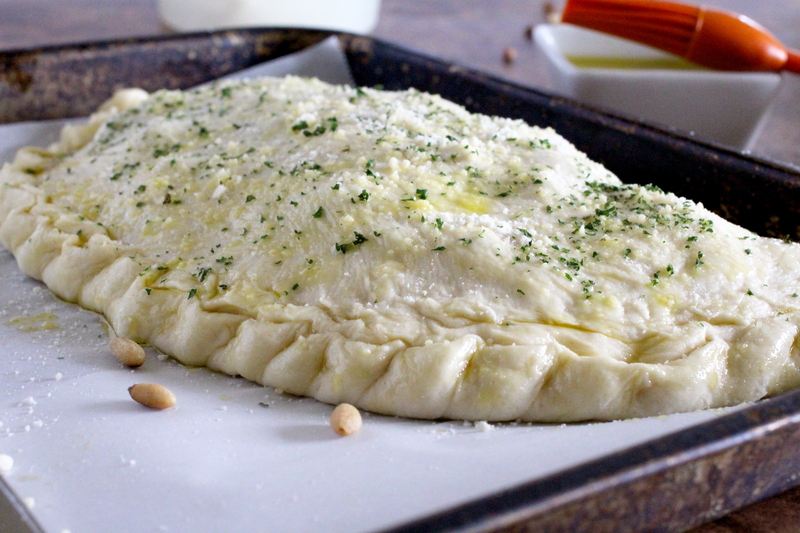 Sprinkle each calzone with Parmesan cheese and dried parsley. Bake for 30 minutes switching the pans half way through for even baking. When ready the calzone will be puffed and golden brown. Let cook a little before slicing and serving. Toast the pine nuts in a small skillet over medium-low heat until they are lightly golden. You'll want to keep an eye on them as they're browning because they can burn very quickly.